Clark Commons is the affordable housing component of a 12-acre development created with City Ventures and the city of Buena Park, Calif.
Home to 70 families with over 160 children, a new affordable housing development in Buena Park, Calif., is doing more than just providing housing. 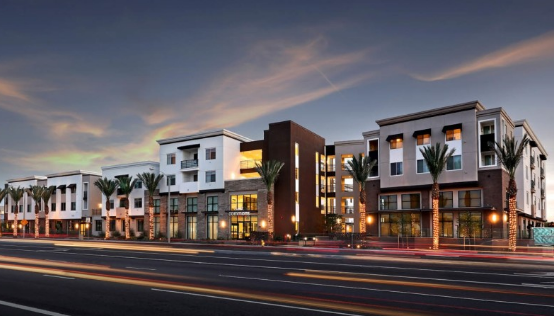 The recently completed Clark Commons, developed by Irvine-based nonprofit Jamboree Housing, revitalizes a blighted corner of the city and serves as a key neighborhood asset. According to Victoria Ramirez, senior project manager for Jamboree, Clark Commons is helping to meet the tremendous need for affordable housing in the area. The community, which serves households earning between 30% and 60% of the area median income, was 100% leased on the day it opened and has a waiting list of over 3,000 households. The development, featuring a mix of one-, two-, and three-bedroom units, has a strong focus on families. It includes a tot lot, outdoor dining areas as well as a 3,000-square-foot community center with conference, computer, media, and activity rooms for residents as well as the surrounding neighborhood. It also provides resident services, including homework assistance, tutoring, and health and wellness programs. Located next door to the Mabel L. Pendleton Elementary School, Jamboree has partnered with the Buena Park School District to help further the districts K-6 digital learning initiative and grade-level reading campaign. We are grateful to have this opportunity to support a great community. The elementary school is so inspiring, says George Searcy, vice president of community impact for Jamboree. We are happy to support them in the great work they are doing on behalf of all of our families and children. Searcy, who served as principal for the day and delivered books to classrooms at the elementary, adds that the Jamboree staff and other partners have been collaborating with the school and the PTA to advance the literacy initiatives. With a large number of Clark Commons children attending the elementary, Jamboree purchased tablets so that they will have access to computer technology in their homes and is using the Footsteps2Brilliance platform that recommends grade-level books and keeps track of reading. The development also will feature a pop-up library in the community room over the summer. To aid parents in the community, the developer runs English as a Second Language classes twice a week. In addition to literacy efforts, the development will devote 1,500 square feet of its community space to house programs through the Clark Commons Collaborative, which will focus on bringing down rates of childhood obesity in the community. Collaborative partners include the city of Buena Park, including its FIT Cities Initiative; Buena Park High School; California State University Fullerton Department of Health Science; Community Action Partnership of Orange County; Giving Children Hope; Mabel L. Pendleton Elementary School; North County Regional Occupational Program; Orange County Health Care Agency; and St. Jude Medical Center Healthy Communities Initiative. The collaborative plans to have the programming up and running over the summer and will include a teaching kitchen with nutrition classes and other health services, including exercise. The smoke-free, transit-oriented development features energy-efficient appliances, fixtures, and lighting as well as water-conserving plumbing fixtures. It received LEED for Homes gold certification and exceeds Californias Title 24 energy-efficiency standards by at least 15%. Financing for the $29.3 million development included $18.4 million in 9% low-income housing tax credit equity invested by Bank of America Merrill Lynch, which also provided a $17 million construction loan and a $2.9 million permanent loan. The city also provided $7.7 million in loans. Additional project partners include architect Danielian Associates, Portrait Construction as the general contractor, Summers Murphy & Partners as landscape architect, and FPI Management as property manager.